IFSEC 2013 is upon us! And one of our Site Sponsors, 360 Vision Technology, have given us a sneak preview of what they are up to up at the NEC this year! Making it’s official pre-launch debut is the exciting new HD PREDATOR ! we spoke with Mark Rees and asked what is the expected compatibility – he told us that right now, anything that is Profile ‘S’ on the ONVIF 2.2 platform will control and operate the Predator’s PTZ functions – including their patent pending White Light/IR LEDs and Wiper functions! 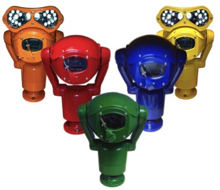 Mark said this was a game changing product in that no other ruggedised PTZ camera was available with the range of functions, on a hugely compatible IP Platform and with HD 1080p resolution too ! Also launching their ‘Any Colour, Any Quantity’ message, 360 Vision really do have a great choice of products for the ever increasing world of IP ! We have been promised a review the HD Predator right after IFSEC where we can report more on the quality of that great looking new Sony 30x HD camera! This entry was posted on Saturday, May 11th, 2013 at 17:19	and is filed under HDCCTV. You can follow any responses to this entry through the RSS 2.0 feed. Both comments and pings are currently closed.